IN judging the prevalence and velocity of the wind for any period, not only must the Air Movement Chart be considered, but also the Temperature Chart for the season. If the Temperature Chart does not indicate wind for the season, it takes an Air Movement Chart showing much activity to give even a moderate amount of wind. Each of the Air Movement Charts indicates how much, relative to the Temperature Chart for the season, will be present during the period it governs. And it shows exclusively, without reference to any other chart, on what dates such wind movements as take place will happen. And, of course, before any intelligent predictions can be made as to wind from an Air Movement Chart, there must be a thorough knowledge as to just how much wind commonly may be expected at the given season. The chart is not absolute; it merely indicates the variations from the normal air movements, and when they will occur. 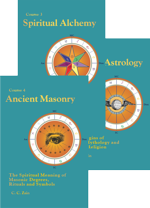 The Air Movement Charts are erected, at the place where it is desired to determine the air movements, for the exact moment the planet Mercury, either by direct motion or by retrograde motion, enters each sign. The chart so erected governs the wind for the period until Mercury, either by direct or by retrograde motion, enters another sign. The stay of Mercury in a sign is variable. It may be only sixteen days, or it may be over two months. Like the wind, Mercury?s movements are changeable. But however short or however long Mercury stays in a sign, that period is governed by the Air Movement Chart. Unfortunately for ease in erecting Air Movement Charts, most ephemerides do not give the time of day when Mercury enters each sign. Before 1941 none of them did, but commencing that year the American Astrology Ephemeris has annually been giving this data precisely for Eastern Standard Time. As this is five hours west, the EGMT may be found by adding five hours to the time thus given, and the Local Mean Time may be found by adding the time difference the place is east of the 75th meridian, or subtracting the time difference the place is west of the 75th meridian. If the American Astrology Ephemeris is used, in calculating both the positions of the planets and the Sidereal Time for which the chart is erected, the interval is 12h greater than when using a noon ephemeris, for its positions are calculated for 0h, the commencement of the civil day, which is the midnight preceding noon on that day. But if the year is earlier than 1941, or an American Astrology Ephemeris is not at hand, the time Mercury enters each sign must be calculated. The rule for finding the time it thus enters a sign is given above, and is illustrated by examples in considering the charts to be studied in this chapter. For wind during the period covered by each Air Movement Chart, no other charts should be consulted as to the time when the winds will occur. 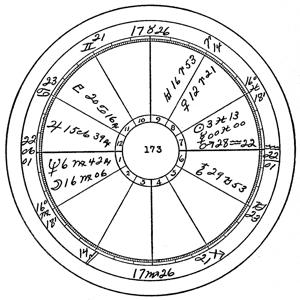 Winds are indicated by the aspects made by the planets, in their movement through the zodiac and by change in declination, to the degree on the Ascendant of the Air Movement Chart covering the period. Mild aspects from mild planets do not stir up heavy winds, but only mild air movements. The more violent the planet and the more violent the aspect the more violent will be the wind indicated, always, of course, subject to what the chart indicates, and to the indications of the season Temperature Chart. There is only one way to become sufficiently familiar with Air Movement Charts as indicating winds at any particular place that reliable predictions can be made. That is actually to observe each aspect as it forms to the Ascendant and the air movement coincident with it. This should be done from day to day over considerable time. Weather Station reports, such as now in many regions are given over the radio, will assist in this. But I have found that with no wind blowing at 6:00 A.M., at the time the wind movement is recorded in the Weather Maps used in these studies, that it may be blowing a gale by 11:00 A.M., and quite subsided by sundown. Repeatedly, days on which the Weather Map has thus recorded almost no air movement at the time the observation was recorded for its use, I have observed much of the day to be gusty, or even extremely windy. What the average individual wants, is to know, not how much wind is blowing before breakfast, but whether it will blow enough at any time during the day to inconvenience him in some anticipated undertaking. I mention this not in criticism of the Weather Map, which served its own purpose, but to indicate that in checking what the wind was on a given day its use is very restricted. Also, that the proper approach to understanding how to predict wind movements is carefully to watch the aspects of the planets to the Ascendant of the Air Movement Charts, and to record, in terms applicable to human undertakings, just what the wind did on such days. Thus it may be recorded that there was a strong wind from the northwest all day, that it was quiet in the morning but gusty in the afternoon, that it was blowing a gale during the night, but quieted down by 10:00 A.M., that there was a warm zephyr, or whatever the conditions were. These notes, together with the aspects to the Ascendant which coincided with the recorded air movements, will form a sound basis for predictions in the kind of terms that the ordinary person understands and can use in his everyday planning. To illustrate the method used, however, I will have recourse again to the Weather Maps issued by the U. S. Department of Agriculture, Weather Bureau. These maps up to July 7, 1932, as issued in California, give the velocity of the wind at certain stations at 6:00 A.M., Pacific Standard Time. After July 7, due to economy imposed upon the Weather Bureau, the velocity was not given. Some information, however, can be gleaned from the Climatological Data for each month, and we can use it as far as it goes. The ephemeris shows that between midnight Dec. 19 and midnight Dec. 20, 1931, Mercury backed into Sagittarius. At midnight Dec. 19 (daily motion between Dec. 19 and Dec. 20) Mercury is moving 1° 20′. At midnight Dec. 20 (daily motion between Dec. 20 and Dec. 21) Mercury is moving 1° 22′. The increment during 24 hours is the difference, which is 2′. The increment at noon on Dec. 20 is one-half of this, or 1′. Between Dec. 19 noon and Dec. 20 noon Mercury moves 1° 20′. Adding the 1′ gives the travel on Dec. 20 at noon as 1° 21′. At noon Dec. 20 Mercury is past the aspect (b) 14′. Between Dec.19 noon and Dec. 20 noon as Mercury moves 80′, to find the increment one-half way from noon we take 7/80 of the daily increment of 2′, which is 0′. We thus use the noon travel of Mercury, which is (a) 1° 21′. Subtracting log. (a) 1.2499 from log. (b) 2.0122 gives .7623, which is the log, of (d) 4h 09m. Subtracting this from noon gives the Greenwich time as Dec. 20, 7:51 A.M. Subtracting 7h 53m (difference in time at Los Angeles) from this gives the time for erecting the chart as December 19, 1931, 11:58 P.M. LMT., Los Angeles. Chart No. 170, erected for this data, is given in Serial Lesson 191 (Course XV, Chapter 2). Los Angeles and its suburbs extend from the ocean to the mountains, and the Weather Bureau makes a separate wind velocity report from each edge of the region. One daily report is from Los Angeles Harbor, on the ocean, and the other is at the observatory on Mt. Wilson, about a mile in elevation, and plainly visible from Los Angeles. Roughly, the two stations thus reporting are about 40 miles apart, Los Angeles Harbor being visible from Mt. Wilson when the weather is clear. While the wind in the metropolitan area of Los Angeles will almost always be of less velocity than the average of the two observation points, the average of the wind velocity at these two points is probably the best index we could have of the average over the Los Angeles area, it being understood that these observations do not cover the entire day, but are for 6:00 A.M. Pacific Standard Time. Therefore, in indicating the effect of the wind, not for the whole day, but as it is recorded at 6:00 A.M., I shall consider all the aspects formed to the Ascendant, and give the wind velocity as reported on that day at both observation points. This Air Movement Chart indicates the wind, modified by seasonal Temperature Chart No. 165, given in Serial Lesson 190 (Course XV, Chapter 1), from Dec. 19, 1931, until Jan. 14, 1932. This Air Movement Chart No. 170 (Serial Lesson 191 (Course XV, Chapter 2) has windy Mercury, active Mars, stormy Saturn and moderating Venus in the fourth. Breezy Sagittarius is on the cusp of the fourth, and its ruler, Jupiter, is in the calm sign Leo. This accounts for one-half of the influence of the chart. Windy Virgo is on the cusp of the first, and Mercury, its ruler, is in the windy sign Capricorn. This accounts for one-fourth of the influence of the chart. Jupiter, ruling the sign Mercury is backing into, is in calm Leo. This accounts for one-eighth of the influence of the chart. Of the planets in angles, Pluto, Uranus, Mercury, Mars and Saturn tend toward wind, while only Venus tends toward calm. This accounts for one-eighth of the influence of the chart. While there would be some calm days, the indications are that there would be more wind than normal. This was borne out by Climatological Data. 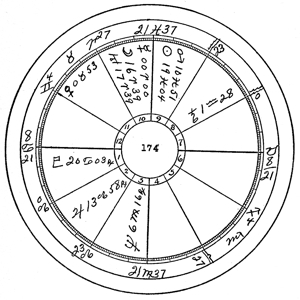 In considering the aspects of the planets to the Ascendant of an Air Movement Chart it should be borne in mind that, as a rule, violent aspects, such as oppositions and squares, signify more wind than do harmonious aspects, such as trines and sextiles. The Ascendant is occupied by 27 Virgo 52, which gives its declination as 00 S 50. Dec. 20, the Sun made the square to the Asc., but as it was Sunday there was no record. Dec. 21, the Moon came to the trine of the Asc., with wind registering 10 miles at the Harbor and only five miles at Mt. Wilson. 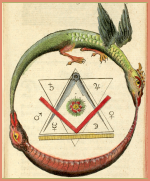 Dec. 22, Mercury made the square to the Asc., but this aspect, possibly due to trine of Moon to Asc., brought. only five miles at the Harbor and four miles velocity on Mt. Wilson. Dec. 24, the Moon came square the Asc. from the windy sign Gemini, and the wind rose in velocity to eight miles an hour at the Harbor and to 20 miles an hour on Mt. Wilson. Dec. 26, the Moon made the sextile to the Asc., and the wind at 6:00 A.M. was eight miles an hour at the Harbor and 15 miles an hour on Mt. Wilson. Dec. 28, the Moon was semisextile the Asc. from the calm sign Leo, resulting in wind velocity of six miles an hour at the Harbor and 15 miles an hour on Mt. Wilson. Dec. 30, the Moon made the conjunction with the Asc., with a wind of only five miles an hour both at the Harbor and on Mt. Wilson. This day the Moon was also parallel the Asc. Jan. 2, 1932, when the Moon came to the semisextile of the Asc. from the windy sign Libra, the wind velocity at both the Harbor and Mt. Wilson went up to 10 miles an hour at 6:00 A.M.
Jan. 2, Venus from the moderate sign Aquarius made the sesquisquare of the Asc., and the wind registered only three miles at the Harbor, but was up to 45 miles an hour on Mt. Wilson. The sesquisquare is not a harmonious aspect. Jan. 6, the Moon was square the Asc. from the fairly active sign Sagittarius, and the wind at the Harbor registered eight miles an hour and on Mt. Wilson only four miles an hour. Jan. 9, the Moon made the sesquisquare of the Asc., and the wind registered only three miles an hour at both stations. Jan. 11, the inconjunct of the Moon from Aquarius, a sign usually giving moderate movement, increased the velocity to 10 miles at the Harbor and to 12 miles on Mt. Wilson. Jan. 12, showed little wind at 6 A.M., but that day windy Mercury made the square of the Asc., and on the 13th the Moon made the opposition of the Asc. from the windy sign Capricorn, resulting in a wind velocity of 18 miles an hour at the Harbor, but only eight miles an hour on Mt. Wilson. Jan. 14, Mars came to the trine of the Asc., and the wind continued with some velocity, registering 10 miles at the Harbor and 13 miles on Mt. Wilson. The ephemeris shows that Mercury goes into Capricorn between midnight Dec. 13 and midnight Dec. 14. At midnight Dec. 13 (daily motion between Dec. 13 and Dec. 14) Mercury is moving 1° 08′. At midnight Dec. 14 (daily motion between Dec. 14 and Dec. 15) Mercury is moving 1° 11′. The increment during 24 hours is the difference, or 3′. The increment at noon on Jan. 14 is one-half of 3′, or 1½′. Adding the 1½′ to the motion at midnight Dec. 13, gives the travel on Jan. 14 at noon as 1° 9½′. At noon Jan. 14 to reach the aspect Mercury must move (b) 2′. Between Jan. 14 and Jan. 15 Mercury moves 1° 11′, or 71′. To find the increment one-half way from noon to the position 2′ past noon we take 1/71 of the daily increment of 3′, or 0′. As the increment is a little more than that at noon, we use the noon travel, but the larger even ′ instead of the smaller. This gives the travel (a) as 1° 10′. Subtracting log. (a) 1.3 133 from log. (b) 2.8573 gives 1.5440, which is the log, of (d) 41m. Adding this to Greenwich noon gives the EGMT as Jan. 14, 12:41 P.M. Subtracting the time difference from Los Angeles—7h 53m—gives the time for erecting the chart at Los Angeles as Jan. 14, 1932, 4:48 A.M. LMT. Chart No. 171, erected for this data, is given in Serial Lesson 191 (Course XV, Chapter 2). Windy Uranus and breezy Moon are in the fourth house. Breezy Aries is on the cusp of the fourth, and its ruler, Mars, is in windy Capricorn. This accounts for one-half of the influence of the chart. Windy Mercury is in the first house. Breezy Sagittarius is on the cusp of the first, and its ruler, Jupiter, is in the calm sign Leo. This accounts for one-fourth of the influence of the chart. Saturn, ruler of the sign occupied by Mercury, is in windy Capricorn. This accounts for one-eighth of the influence of the chart. Of the planets in angles, Pluto and Uranus are windy and the Moon is breezy. This accounts for one-eighth of the influence of the chart. We must conclude from the above that the period covered by this chart will be windy. Climatological Data bears this out, recording two storms; one from the 12th to the 15th, and the other from the 30th to the 31st. The first of these storms started under chart No. 170 when, as mentioned, first Mercury came square to its Asc., and then Mars came trine to its Asc., but carried on under chart No. 171, here considered. “High winds occurred during the two stormy periods.” “On the 29th several stations in the mountain sections reported a blizzard.” Mercury in Capricorn on that day was both parallel the Asc. and semisextile the Asc. Capricorn favors blizzards. On January 22 Jupiter backed to the one effective degree of orb of trine Asc., and remained within orb until the new Air Movement Chart came in on Feb. 4. Strong aspects to the Asc. from slow moving planets, as will be indicated in Chapter 7 (Serial Lesson 196), “Tornados and Hurricanes,” favor storms. Jan. 15, the Moon came trine the Asc. from the fairly windy sign Aries, and the velocity registered at the Harbor was 24 miles, and on Mt. Wilson it was 10 miles an hour. Jan. 16, the Moon moved into the still sign Taurus, and made the sesquisquare to the Asc. The wind moderated some, showing only six miles at the Harbor and 10 miles on Mt. Wilson. Jan. 20, after being quite mild for a day or two, when Mercury came parallel the Asc., and the Moon made the opposition to the Asc. from the windy sign Gemini, the velocity jumped to 16 miles at the Harbor and 30 miles on Mt. Wilson. Jan. 23, again after having a low velocity for a day or two, under the influence of active Mars semisquare the Asc., and Jupiter trine Asc., the velocity again went up; this time to 20 miles at the Harbor and 35 miles on Mt. Wilson. The Moon on the same day was inconjunct the Asc. Jan. 25, the Sun, a still planet, made the semisquare to the Asc. from breezy Aquarius. The velocity at the Harbor was six miles, and on Mt. Wilson only five miles an hour. Jan. 27, the Moon came to the square of the Asc. from windy Virgo, and the velocity increased somewhat, registering eight miles an hour at the Harbor and five miles on Mt. Wilson. Jan. 28, windy Mercury came semisextile the Asc., Jupiter was in perfect trine with the Asc., and the Moon was sextile the Asc. The wind increased to 12 miles an hour at the Harbor, and to 40 miles an hour on Mt. Wilson. Jan. 30, with Mercury closely parallel the Asc. since the 27th, and the Jupiter aspect still close, the velocity at the Harbor was eight miles an hour, and on Mt. Wilson 10 miles an hour. Feb. 2, the Moon came conjunction the Asc., in the rather active sign Sagittarius, and the wind jumped to 16 miles at the Harbor. There was no record for that day on Mt. Wilson. Feb. 3, Venus in Pisces, a rather still sign, came to the rather violent aspect, square the Asc. The result was 12 miles recorded at the Harbor, and five miles on Mt. Wilson. Had the aspect been from a more active sign, even though Venus is not a violent planet, but rather mild, the wind, no doubt, would have been higher. The ephemeris shows that between midnight Feb. 4 and midnight Feb. 5 Mercury moves into Aquarius. At midnight Feb. 4 (daily motion between Feb. 4 and Feb. 5) Mercury moves 1° 33′. At midnight Feb. 5 (daily motion between Feb. 5 and Feb. 6) Mercury moves 1° 34′. The increment during 24 hours is the difference, which is 1′. The increment at noon on Feb. 5 is one-half of this, or ½′. The travel between noon Feb. 4 and noon Feb. 5 is 1°deg; 33′. Adding the ½′ to this gives the travel on Feb. 5 at noon as 1° 33½′. At noon Feb. 5 Mercury is (b) 37′ past the required position. Between Feb. 4 and Feb. 5 Mercury moves 93′. To find the increment one-half way from noon we take 19/93 of the daily increment of 1′, which is 0′. As the travel is slightly less than the 1° 33½′ at noon on Feb. 5, we use (a) 1° 33′ as its travel. Subtracting log. (a) 1.1899 from log. (b) 1.5902 gives .4012, which is the log, of (d) 9h 33m. Subtracting the 9h 33m from noon gives the Greenwich time as Feb. 5, 2:27 A.M. From this subtract 7h 53m, the time difference of Los Angeles, and it gives the time for which the chart should be erected as Feb. 4,1932, 6:34 P.M. LMT, Los Angeles. Chart No. 172, erected for this data, is given in Serial Lesson 191 (Course XV, Chapter 2). Scorpio, on the cusp of the fourth does not indicate wind unless the chart as a whole does. Its ruler, Mars, is in breezy Aquarius, and its coruler, Pluto, is in the quiet sign Cancer. This accounts for one-half of the influence of the chart. Calm Neptune is in the first house. Calm Leo is on the cusp of the first, and the Sun, its ruler, is in breezy Aquarius. This accounts for one-fourth of the influence of the chart. Uranus, ruler of the sign occupied by Mercury, is in windy Aries. This accounts for one-eighth of the influence of the chart. Of the planets in angles, both Neptune and Venus are calm. This accounts for one-eighth of the influence of the chart. We conclude from the above that while there may be a few blustery days, indicated by Uranus in Aries, the period as a whole will have little wind. This is borne out by the report in Climatological Data. 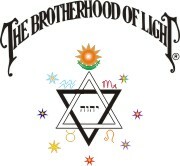 The chart has 28 Leo 41 on the Ascendant, which gives the declination of the Asc. as 11 N 56. The strongest indication of wind in the chart is Saturn within the one effective degree of orb of inconjunct the Asc. As this aspect came closer, even though an inconjunct, there was hail and sleet and some wind, registering highest two days before the aspect was perfect. Saturn is the storm planet. Feb. 7, the Moon came parallel and opposition the Asc., but there is no record for that day as it was Sunday. The following day, Feb. 8, there was 10 miles an hour at the Harbor, but no record for Mt. Wilson. Feb. 9, the Moon came inconjunct the Asc., and Saturn was within the one degree of effective orb of inconjunct the Asc. The wind registered 20 miles an hour at the Harbor and 10 miles an hour on Mt. Wilson. Feb. 10, the Moon was sesquisquare the Asc., and Saturn closer to perfect inconjunct the Asc. The wind registered 12 miles an hour at the Harbor and 14 miles on Mt. Wilson. Feb. 11, Saturn made the perfect inconjunct to the Asc., and Venus made the inconjunct to the Asc. The wind registered eight miles at the Harbor and 15 miles on Mt. Wilson. Feb. 12, the Moon came trine the Asc., and the wind went down to five miles an hour both at the Harbor and on Mt. Wilson. Feb. 14, the Moon made the square of Asc., but as this was Sunday there was no record. The Moon was in Taurus, and on the 15th the wind registered only eight miles at the Harbor and four miles on Mt. Wilson. Feb. 17, the Moon made the sextile to the Asc., with a wind velocity of eight miles at the Harbor, and four miles on Mt. Wilson. Feb. 18, the Sun made the opposition to the Asc., and the velocity at the Harbor jumped to 12 miles an hour, but was still only four miles an hour on Mt. Wilson. Feb. 19, the Moon came to the semisextile of the Asc., and kept the wind, with the help of the Sun opposition Asc. still in orb, 10 miles an hour at the Harbor, and raised it to 20 miles on Mt. Wilson. Feb. 21 was Sunday, and the 22 was on a holiday, so there are no records for these two days. 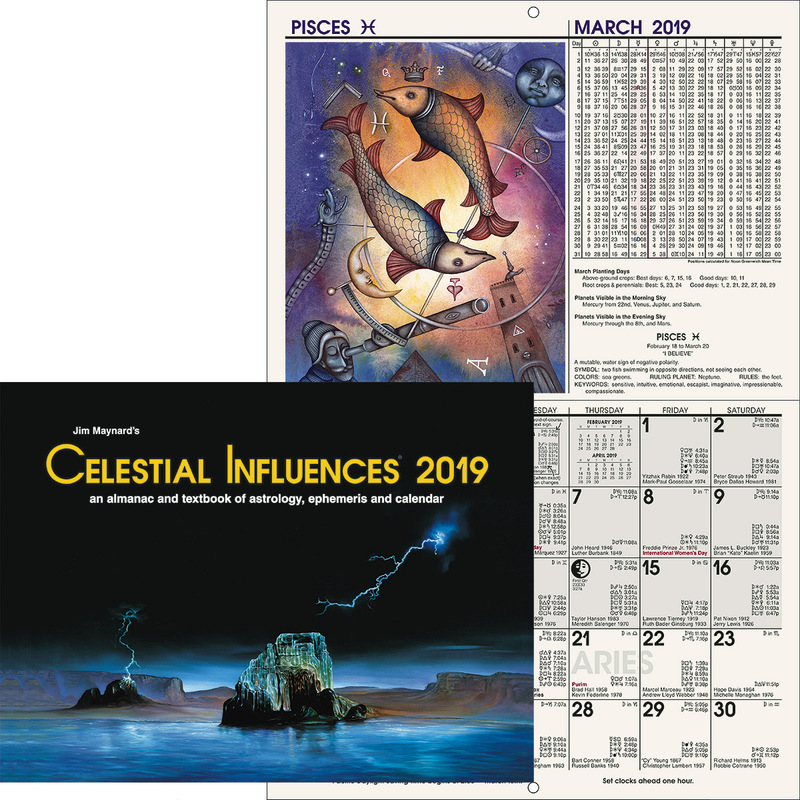 The ephemeris shows that Mercury goes into Pisces between midnight Feb. 22, and midnight Feb. 23, 1932. At midnight Feb. 22 (daily motion between Feb. 22 and Feb. 23) Mercury is moving 1° 48′. At midnight Feb. 23 (daily motion between Feb. 23 and Feb. 24) Mercury is moving 1° 50′. The increment during the 24 hours is the difference, which is 2′. The increment at noon on Feb. 23 is one-half of this, or 1′. Adding the 1′ to the travel of Mercury at midnight of Feb. 22, gives its travel at noon of Feb. 23 as 1° 49′. Between Feb. 22 and Feb. 23 Mercury moves 1°08′. At noon Mercury is (b) 51′ past the required position. We want the increment for one-half this distance, or 26/108 of the daily increment of 2′, which gives 0′. Thus we use the noon motion of Mercury on Feb. 23, which as above found is (a) 1° 49′. Subtracting log. (a) 1.1209 from log. (b) 1.4508, gives .3299, which is the log, of (d) 11h 14m. Subtracting 11h 14m from noon gives the Greenwich time as Feb. 23, 12:46 A.M. From this subtracting the Los Angeles time difference of 7h 53m, gives the time at Los Angeles as Feb. 22, 1932, 4:53 P.M. LMT. Chart No. 173, is erected for this data. Scorpio, ruler of the cusp of the fourth, gives little wind unless the chart as a whole indicates it. One of its rulers, Mars, is in breezy Aquarius, and the other, Pluto, is in calm Cancer. This accounts for one-half of the influence of the chart. Breezy Moon and quiet Neptune are in the first. Quiet Leo is on the cusp of the first, and its ruler, the Sun, is in calm Pisces. This accounts for one-fourth of the influence of the chart. Neptune, ruler of the sign occupied by Mercury, is in windy Virgo. This accounts for one-eighth of the influence of the chart. Of the five planets in angles, Sun and Neptune are calm, Mars and the Moon are breezy, and Mercury is windy. This accounts for one-eighth of the influence of the chart. The indications for the duration of this chart are that there will be some windy days, but that the wind will not be violent, and that days of moderate wind movement will be more common. Feb. 23, the Moon made the semisextile to the Asc. from windy Virgo. Only two miles per hour was registered at the Harbor, but the velocity was 20 miles an hour on Mt. Wilson. Feb. 24, the Moon was semisquare the Asc. from windy Libra, and the wind was blowing 12 miles an hour at the Harbor and five miles an hour on Mt. Wilson. Feb. 25, the Moon was sextile the Asc. from windy Libra, and the wind was blowing 11 miles an hour at the Harbor and 10 miles an hour on Mt. Wilson. Feb. 27, the Moon came square the Asc. from the sometimes violent sign Scorpio, and the wind at the Harbor registered 16 miles an hour, and on Mt. Wilson five miles an hour. Feb. 29, the Moon came trine the Asc. from the fairly windy sign Sagittarius, and the wind registered at the Harbor 10 miles an hour, and on Mt. Wilson eight miles an hour. March 1, the Moon was sesquisquare the Asc., with only five miles registered at the Harbor, and no wind on Mt. Wilson. Venus was also trine the Asc., but its influence is generally to moderate. March 4, the Moon came opposition the Asc., and the wind at the Harbor registered four miles and on Mt. Wilson 14 miles an hour. March 5,Mercury made the inconjunct to the Asc., with only three miles an hour at the Harbor, but 12 miles an hour on Mt. Wilson. March 7, the Moon was inconjunct the Asc. from the calm sign Pisces, and the wind at the Harbor was six miles an hour, and on Mt. Wilson five miles an hour. March 8, the Moon was sesquisquare the Asc., and the wind at the Harbor registered six miles an hour, and on Mt. Wilson five miles an hour. The ephemeris shows that Mercury goes into Aries between midnight March 9 and midnight March 10, 1932. At midnight March 8 (daily motion between March 8 and March 9) Mercury is moving 1° 55′. At midnight March 9 (daily motion between March 9 and March 10) Mercury is moving 1° 54′. The decrement during 24 hours is the difference, which is 1′. The decrement on March 9 at noon is one-half of this or ½′. Adding the ½′ to the travel of Mercury at midnight of March 9, gives the travel at noon of March 9 as 1° 54½′. Between noon March 9 and noon March 10 Mercury moves 1°14′. At noon on March 9 Mercury needs to move (b) 39′ to reach the required position. We want the decrement for one-half this distance, or 20/114 of the daily decrement of 1′, which gives 0′. We thus use the nearest even ′ to the noon travel, which, as the position is reached after noon, is nearer (a) 1° 54′. Subtracting log. (a) 1.1015 from log. (b) 1.5673 gives .4658, which is the log. of (d) 8h 13m. Adding the 8h 13m to noon gives the Greenwich time as 8:13 P.M. From this subtracting the 7h 53m time difference of Los Angeles, gives the time at Los Angeles as March 9, 1932, 12:20 P.M. LMT. Chart No. 174, is erected for this data. Windy Virgo is on the cusp of the fourth, and its ruler, Mercury, is in windy Aries. This accounts for one-half of the influence of the chart. Windy Pluto is in the first house, with breezy Cancer on the cusp of the first. Its ruler, the Moon, is in windy Aries. This accounts for one-fourth of the influence of the chart. Mars, ruler of the sign occupied by Mercury, is in calm Pieces. This accounts for one-eighth of the influence of the chart. Of the planets in angles, Pluto, Mercury and Uranus are windy, and the Moon is breezy. This accounts for one-eighth of the influence of the chart. The indications are that while during the period there will be many fairly calm days, the windy influences are pronounced enough that quite high winds may be expected at times. This is borne out by Climatological Data, which records several days of high wind in April. The Ascendant is occupied by 8 Cancer 21, with a declination of 23 N 11. March 11, the Moon made the sextile to the Asc. from Taurus, a mild aspect and a mild sign, and the wind at the Harbor recorded six miles an hour, and on Mt. Wilson eight miles an hour. March 12, the Moon was semisquare the Asc. from Taurus, and parallel the Asc. The wind at the Harbor registered five miles an hour, and at Mt. Wilson eight miles an hour. March 13, when the Moon made the semisextile to the Asc. was Sunday and there is no record. March 14, Mercury made the square to the Asc., and the wind recorded at 6:00 A.M. on the 15th was 10 miles an hour at the Harbor and four miles an hour at Mt. Wilson. March 16, Venus came sextile the Asc. from Taurus, and the Moon came conjunction the Asc. While the wind at the Harbor was only three miles an hour, on Mt. Wilson it was 35 miles an hour. March 17, as a result of the two previous aspects, the wind at the Harbor was still three miles an hour, but had eased off on Mt. Wilson to 20 miles an hour. March 18, the Moon was parallel Asc., but was also semisextile Asc. from the calm sign Leo, and the wind on Mt. Wilson dropped to four miles an hour, and was only four miles an hour at the Harbor. March 19, the Moon was semisquare the Asc. from the still sign Leo, and the wind was only two miles an hour at the Harbor and five miles an hour on Mt. Wilson. In considering the probable influence of the Air Movement Charts in producing wind during the three months following March 20, 1932, the Temperature Chart governing the season should also be scanned to perceive if the season as a whole will be windy. This chart, No. 166, is given in Serial Lesson 190 (Course XV, Chapter 1). It has windy Virgo on the fourth, and its ruler, Mercury, in windy Aries. Windy Pluto is in the first. Calm Cancer is on the cusp of the first, but its ruler, the Moon, is in windy Virgo. Mars, ruling the sign occupied by Mercury, is in calm Pisces. Of the four planets in angles, Sun is calm, but Pluto, Mercury and Uranus are windy. Thus for the season as a whole, considerable wind might be expected. March 20, when the Moon made the sextile of the Asc., was Sunday, and there is no record; but on the following day this aspect from windy Virgo resulted in a record of only four miles an hour at the Harbor, but 25 miles an hour on Mt. Wilson. March 22, when the Moon came square the Asc. from the windy sign Libra, the wind at the Harbor was five miles an hour, but on Mt. Wilson it had increased to 35 miles an hour. The wind moderated on March 23, but March 24 the Moon came trine the Asc. from the extreme sign Scorpio, and while it registered only three miles an hour at the Harbor, it rose to 15 miles an hour on Mt. Wilson. March 25, the Moon was parallel the Asc., and on March 26 it was inconjunct the Asc., resulting in a recording on the 26th at the Harbor of four miles an hour, and 25 miles an hour on Mt. Wilson. March 29, the Sun came square the Asc. and the Moon opposition the Asc., and the wind registered four miles an hour at the Harbor and 10 miles an hour on Mt. Wilson. March 31, the Moon made the inconjunct and the parallel to the Asc., and the velocity at the Harbor was only four miles an hour, and on Mt. Wilson only three miles an hour. April 1, the Moon made the weak aspect, sesquisquare the Asc., and the wind at the Harbor continued at four miles an hour, and on Mt. Wilson at three miles an hour. April 2, the Moon made the trine to the Asc. from the calm sign Pisces, and the wind at the Harbor registered four miles an hour, and on Mt. Wilson six miles an hour. April 5, Venus came parallel Asc., and the Moon made the square to the Asc., and the wind at the Harbor registered four miles an hour, but on Mt. Wilson rose to 10 miles an hour. April 7, the Moon came sextile the Asc., and the wind registered at the Harbor eight miles an hour and on Mt. Wilson five miles an hour. April 8, the Moon in Taurus made the semisquare the Asc., and as this is a slightly violent aspect, the wind gained somewhat, registering eight miles an hour at the Harbor, and 20 miles an hour on Mt. Wilson. April 10, the Moon came semisextile the Asc., but as it was Sunday there is no record. April 12, the Moon was semisextile the Asc., and there was very little wind. April 13, Venus was semisextile the Asc., and this brought the wind up to six miles an hour at the Harbor and to 10 miles an hour on Mt. Wilson. April 14, Mars came square the Asc., and the Moon was parallel the Asc. While at 6:00 A.M. the wind at the Harbor registered only seven miles an hour and at Mt. Wilson only six miles an hour, by the following morning, with Moon semisextile Asc., it had increased to eight miles an hour at the Harbor and to 10 miles an hour on Mt. Wilson. April 17, the Moon came sextile the Asc. from windy Virgo, but it was Sunday and there is no record. The following day, April 18, however, the wind registered five miles an hour at the Harbor and 10 miles an hour on Mt. Wilson. April 19, the Moon came square the Asc. from windy Libra, and the velocity recorded at the Harbor was 12 miles an hour, and on Mt. Wilson seven miles an hour. April 21, the Moon was trine Asc. from the extreme sign Scorpio, and the velocity increased at the Harbor to 12 miles an hour, and on Mt. Wilson to 13 miles an hour. April 22, the Moon made the parallel and the sesquisquare to the Asc., and the velocity was six miles an hour at the Harbor and 10 miles an hour on Mt. Wilson. April 23, the Moon made the inconjunct to the Asc., and there was no wind at the Harbor, and only five miles an hour on Mt. Wilson. April 25, the Moon made the opposition to the Asc. from windy Capricorn, and the wind rose to 10 miles an hour both at the Harbor and on Mt. Wilson. April 27, the Moon made the parallel and the inconjunct aspect from the breezy sign Aquarius, and the wind at the Harbor registered eight miles an hour, while only five miles an hour was registered at Mt. Wilson. April 28, the Sun, still in the calm sign Taurus, made the sextile to the Asc., and the Moon made the sesquisquare to the Asc. There was wind at only two miles velocity at the Harbor, but on Mt. Wilson it went up to 20 miles an hour. April 29, the Moon came to the trine of the Asc. from calm Pisces, and the wind dropped off to three miles an hour both at the Harbor and on Mt. Wilson. May 2, the Moon made the square of the Asc. from windy Aries and the velocity increased to eight miles an hour at the Harbor, but remained at three miles an hour on Mt. Wilson. May 4, the Moon came sextile the Asc., and the wind remained at three miles an hour on Mt. Wilson, and remained at eight miles an hour at the Harbor. May 6, under Moon parallel and semisquare the Asc., the wind increased to seven miles an hour at the Harbor, and to 20 miles an hour on Mt. Wilson. May 7, the Moon came semisextile the Asc. from the windy sign Gemini, and this increased the velocity at the Harbor to eight miles an hour, but on Mt. Wilson the velocity dropped to three miles an hour. May 9, the Moon came conjunction the Asc., a powerful aspect, and the velocity went up to 12 miles an hour at the Harbor and to 13 miles an hour on Mt. Wilson. May 10, the Moon conjunction Asc. on the 9th took place after the 6:00 A.M. recording, and influenced the wind on the 10th also. The record at the Harbor was 10 miles an hour, and on Mt. Wilson 17 miles an hour. May 12, the Moon moved into calm Leo, and made the weak semisextile aspect to the Asc., and the wind went down to only two miles an hour at the Harbor, but retained its 10 mile an hour velocity on Mt. Wilson. May 14, the Moon came sextile the Asc. from windy Virgo, and the velocity at the Harbor was eight miles an hour, and on Mt. Wilson was six miles an hour. The ephemeris shows that Mercury goes into Taurus between midnight May 15 and midnight May 16, 1932. At midnight May 14 (daily motion between May 14 and May 15) Mercury is moving 1° 16′. At midnight May 15 (daily motion between May 15 and May 16) Mercury is moving 1° 19′. The increment is the difference, which is 3′. The increment on May 15 at noon is one-half of this or 1½′ Adding this to the travel at midnight May 14, gives the travel at noon on May 15 as 1° 17½′. Between May 15 and May 16 Mercury moves 79′. At noon May 15 Mercury lacks (b) 35′ of the required position. We want the increment one-half way from noon to this position, or 18/79 of the daily increment of 3′, which is a little less than 1′. To the noon travel of 1° 17½′ we add a little less than 1′ and it gives us the nearest ′ as (a) 1° 18′. Subtracting log. (a) 1.2663 from log. (b) 1.6143 gives .3480, which is the log, of 10h 46m. 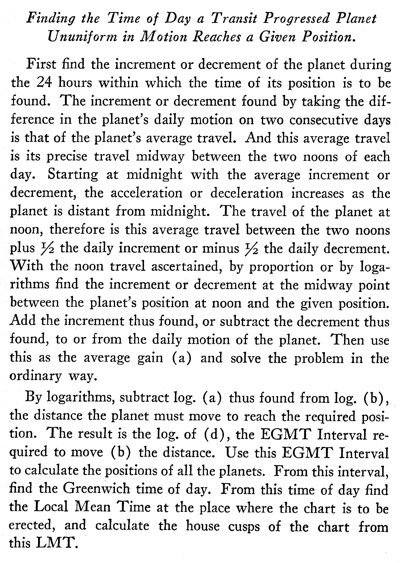 Adding 10h 46m to noon gives the Greenwich time as 10:46 P.M. From this subtracting the 7h 53m difference in time for Los Angeles gives the time at Los Angeles as May 15, 1932, 2:53 P.M. LMT. Chart No. 175 erected for this data is given in Serial Lesson 194 (Course XV, Chapter 5). Windy Capricorn is on the cusp of the fourth. Its ruler, Saturn, is in the breezy sign Aquarius, square windy Mercury. This accounts for one-half the influence of the chart. Windy Libra is on the cusp of the first house, and its ruler, Venus, is in quiet Cancer. This accounts for one-fourth the influence of the chart. Venus, ruler of the sign occupied by Mercury, is in quiet Cancer. This accounts for one-eighth of the influence of the chart. Of the planets in angles, Venus moderates, but Pluto, Mars, Uranus and Saturn are windy. This accounts for one-eighth of the influence of the chart. The indications of the chart are that there would be calm days, followed by other days in which there would be rather high winds. Climatological Data confirms these indications. The Asc. is occupied by 5 Libra 39, with a declination of 2S15. May 16, the Moon came conjunction and parallel the Asc., but the wind registered at the Harbor was only six miles an hour, and on Mt. Wilson three miles an hour. May 18, the Moon came semisextile the Asc. from Scorpio, and the wind velocity at the Harbor was six miles an hour, and on Mt. Wilson was six miles an hour. May 20, the Moon made the mild aspect, sextile Asc., and the velocity at both the Harbor and on Mt. Wilson was only four miles an hour. May 22, the Moon made the square of the Asc. from windy Capricorn. As it was Sunday there is no record. But the following day it registered eight miles an hour at the Harbor and 25 miles an hour on Mt. Wilson. May 24, the Moon made the trine to the Asc., a harmonious aspect, and the wind fell to three miles an hour at the Harbor and to five miles an hour on Mt. Wilson. May 25, the Moon was sesquisquare the Asc., and before the day was out the Sun was trine the Asc. The wind rose to nine miles an hour at the Harbor, and to 20 miles an hour on Mt. Wilson. May 27, the Moon came inconjunct the Asc. from the calm sign Pisces, and the wind dropped to four miles an hour at the Harbor and to 10 miles an hour on Mt. Wilson. May 29, the Moon was opposition the Asc. from windy Aries, but as it was Sunday there was no record. June 1, the Moon was inconjunct the Asc. from the calm sign Taurus, and the wind dropped to only three miles an hour both at the Harbor and on Mt. Wilson. June 3, the Moon came trine the Asc., and the wind was five miles an hour at the Harbor and three miles an hour on Mt. Wilson. June 6, windy Mercury came trine the Asc., and the Moon came square the Asc., and the wind rose on Mt. Wilson to 25 miles an hour, but remained at three miles an hour at the Harbor. June 8, the Moon came sextile the Asc. and Mars made the sesquisquare to the Asc. The velocity at the Harbor was eight miles an hour, and on Mt. Wilson was five miles an hour. June 9, the Moon came semisquare the Asc. from calm Leo, and the wind registered only four miles an hour at the Harbor, and only five miles an hour on Mt. Wilson. 4:53 P.M. LMT; 118:15W. 34N. Scorpio, ruler of the cusp of the fourth gives little wind unless the chart as a whole indicates it. One of its rulers, Mars, is in breezy Aquarius, and the other, Pluto, is in calm Cancer. Breezy Moon and quiet Neptune are in the first. Quiet Leo is on the cusp of the first, and its ruler, the Sun, is in calm Pisces. Neptune, ruler of the sign occupied by Mercury, is in windy Virgo. Of the five planets in angles, Sun and Neptune are calm, Mars and Moon are breezy, and Mercury is windy. 12:20 P.M. LMT; 118:15W 34N. Windy Pluto is in the first house, with calm Cancer on the cusp of the first. Its ruler, the Moon, is in windy Aries. Mars, ruler of the sign occupied by Mercury, is in calm Pisces. Of the planets in angles, Pluto, Mercury and Uranus are windy, and the Moon is breezy.